Paul John Bold 46% – Bold is back and even better! After the Japanese Hakushu, our journey from East to West brought us to our own shores… India. 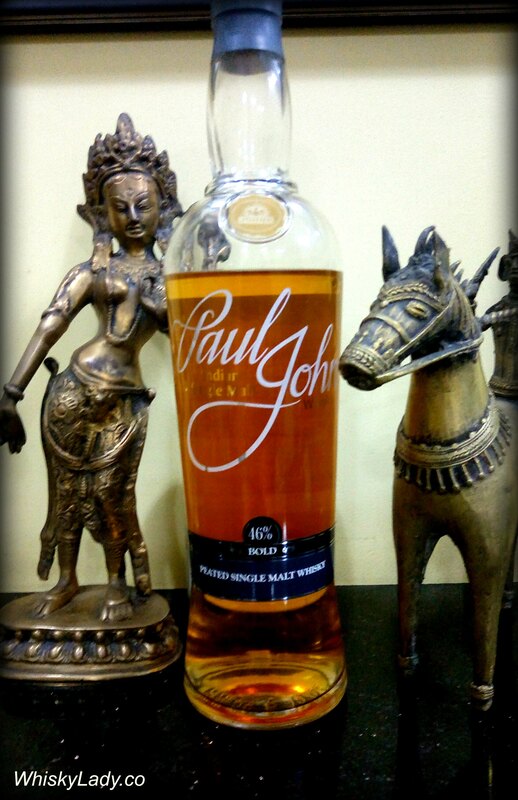 Our original Mumbai based tasting group is no stranger to Goa’s answer to world whisky – Paul John. We found promise in PJ’s Edited back in January 2015, then had a highly sociable evening exploring a Paul John whisky flight in March 2015. Since then, I’ve sampled various bottles and batches – including with our Whisky Ladies – yet not with our ‘original’ tasting group and our strict ‘blind tasting’ approach. Til January 2017… When our host thought it was high time to bring out Bold Batch #4 (Sept 2016) 43%. Nose – Immediate ‘Hello peat, how nice you could drop by!’ Think leather saddles or high quality soft leather shoes, wet rice, fermented barley, old wood, sweet soap, new rubber sole shoes, citrus spice and everything nice! Overall this is the kind of whisky we enjoy. It seemed to be using good quality casks, and while peat was very much present, it was quite a different from a typical Islay ‘in your face’ or ‘retro smoke’ peat quality. Instead we found the peat much more rounded and smooth. In short it was a most enjoyable dram – one you could quite sociably sip with friends. As we began to speculate, it was clearly not a traditional Islay… and our host dropped a hint that it received Jim Murray’s 2016 “Liquid Gold” rating of 95.5 (Batch #1). While we often do not agree with Mr Murray, in this case our delight in the dram was aligned. And the reveal… Paul John Bold?!? Wow! In short – Paul John Bold is just getting better and better! And mighty impressive – particularly for the price point and availability in India. Just to put into perspective – Bold is available for only INR 2,800 (approx $40). These days we are hard pressed to find such an enjoyable whisky below $100 and that too – only outside of India – vying against a precious import ‘quota’ of 2 Litres per person. So bravo Paul John on the Bold front! This entry was posted in Beyond Scotland, India and tagged Bold, Paul John, Paul John Bold, Paul John Bold Batch #4, Peat by Carissa Hickling. Bookmark the permalink.